​On March 14th, our team worked alongside several schools in Albuquerque to hold walkouts at individual schools, with speeches and 17 minutes of silence for the victims of the school shooting in Parkland, Florida. Large schools like La Cueva and Cibola High Schools were reported to have over 500 students participating in each action. On March 24th, the Fight For Our Lives team held a march and rally in solidarity with other major cities across the county. Though our team originally expected between 2,000-5,000 marchers, a reported 10,000 people came out that day to show their support. We wrote letters to the governor, registered voters, and had a performance from local hip-hop artist “Wake-Self”. Speakers ranged from the Mayor Of Albuquerque, Youth Poets, students, teachers, and many others. On April 7th, a team of Fight For Our Lives students from Albuquerque, Santa Fe, and Roswell held a town hall and community forum, where they demanded answers from officials and candidates. Our students asked questions about school safety, implementation of youth voice, and why such a large portion of gun violence in our community comes from our police. Students also offered their own solutions to the problems we discussed and their own personal experiences with gun violence and other issues impacting youth. Official Panelists included Albuquerque Police Chief Michael Geier, State Senator Linda Lopez, Gubernatorial Candidate Jeff Apodaca, Congressional Candidate Deb Haaland, and many others. On the 19th Anniversary of the massacre at Columbine Highschool, our team joined thousands of other students across the country in a massive school walkout. FFOL worked directly with students from Santa Fe to put on a rally at the state capital; over 400 students were reported to have attended. They held a panel with state leaders inside the building, registered voters, helped students write letters to their representatives, and held a rally with student speakers and poets. On the same day of our action at the capitol, leaders from the FFOL team sat down with Michelle Lujan Grisham - Former U.S Congresswoman, and current Governor of New Mexico. We discussed various options to combat gun violence in New Mexico, such as more youth employment opportunities, tighter regulations on the private sales of firearms, and more therapists and counselors in schools, rather than making our schools resemble prisons with guards and metal detectors. On Friday, May 18th, our country saw yet another tragic mass murder of our children in their classrooms. 10 from Santa Fe High School in Santa Fe, TX, eight of them students, were shot and killed, and multiple others were injured. In honor of these students, and the growing number of teens shot and killed on the street of Albuquerque, Fight For Our Lives hosted a candlelight vigil to offer a space for our community to grieve, mourn, and begin to process of healing, as well as urge community involvement and support as we work to solve this American epidemic. 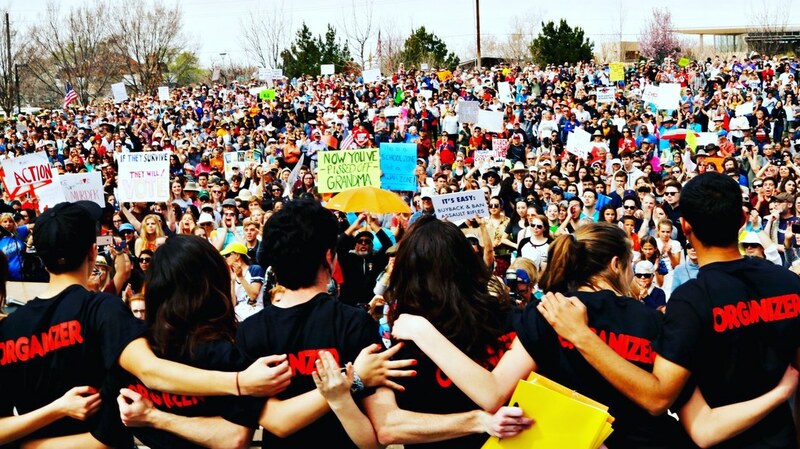 Since 2010 Albuquerque Public Schools has been one of the largest educational beneficiaries of the NRA, taking in over $100,000 from the same organization that's advocating against common-sense gun laws in the wake of tragic events unfolding not only in classrooms but throughout entire communities across the country. Our students rallied outside APS headquarters and attempted to enter the building but got locked out. After watching the doors for almost 20 minutes we got inside and were able to occupy an area in the west wing of the building before APS Board President Dr. Peercy agreed to come and meet with us. On Wednesday, July 11th survivors from Marjory Stoneman Douglas visited Albuquerque as a part of their "Road To Change" Campaign to encourage young people to participate in the 2018 Midterms. Over 200 community members came out for an afternoon of BBQ, Ice cream, and Voter Registration. We also had performances and speeches from local youth poets and powerful student activists. For over a decade, the NRA has chosen Albuquerque as the host for the annual "National Police Shooting Championships" (NPSC) but this year, we put an end to that. Our students not only took over surrounding streets and cut off access to the hosting hotel, but we made several banners and dropped them inside the hotel for hotel guests and NPSC competitors to see. Our students partnered with the awesome women from the NM Women's March organization to help host the 2019 New Mexico Women's March. Over 5,000 New Mexicans came out show support for Women's Rights and gender equality. Speakers and Performers included: U.S Representative Deb Haaland, ABQ First Lady Elizabeth Keller, Slam Poet Jessica Helen Lopez, and many more! Fight For Our Lives partnered with the Native American Community Academy (NACA), SouthWest Organizing Project (SWOP), New Mexico Dream Team (NMDT) and the Learning Alliance of New Mexico to take over 60 students to the State Capitol to advocate for several bills relating to gun control, education reform, and immigration. On Febuary 21st, our students got the chance to sit down with our newly elected congresswoman Deb Haaland. We covered many topics from school safety and gun control, to suicide, street violence, police violence, and youth empowerment. We feel honored to have a fierce woman like Congresswoman Haaland fighting for us in DC, and look forward to working together in the future!